I love Easter. It is everything that is spring. The sun shining. The grass growing. The birds coming back from their winter rest and chirping in the trees. I love the bright spring colors of flowers poking their heads up in anticipation of sunny, warm days. Fresh beginnings arising from the cold, dark winter. Hope springs eternal. 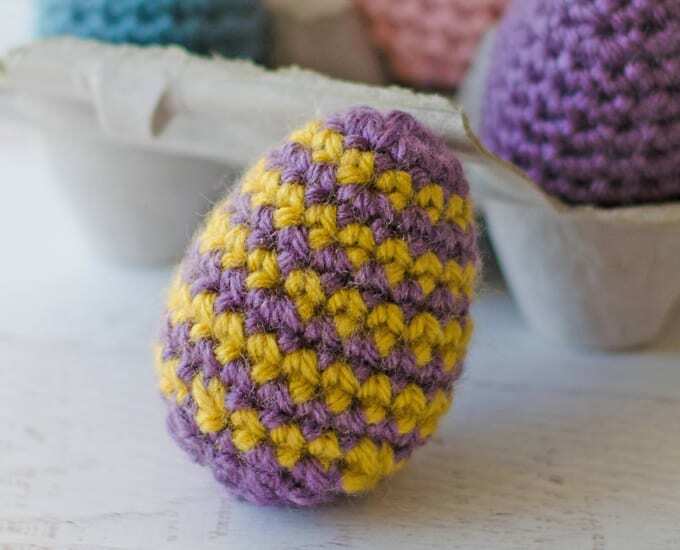 And this Crochet Easter Eggs pattern will warm your heart and brighten your spring day. 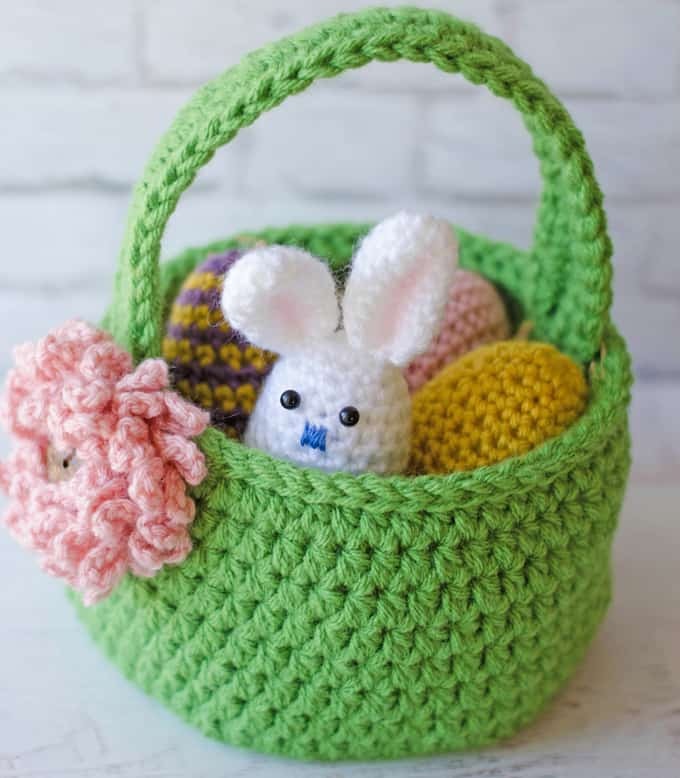 I’ve got a three-part Easter crochet series for you. 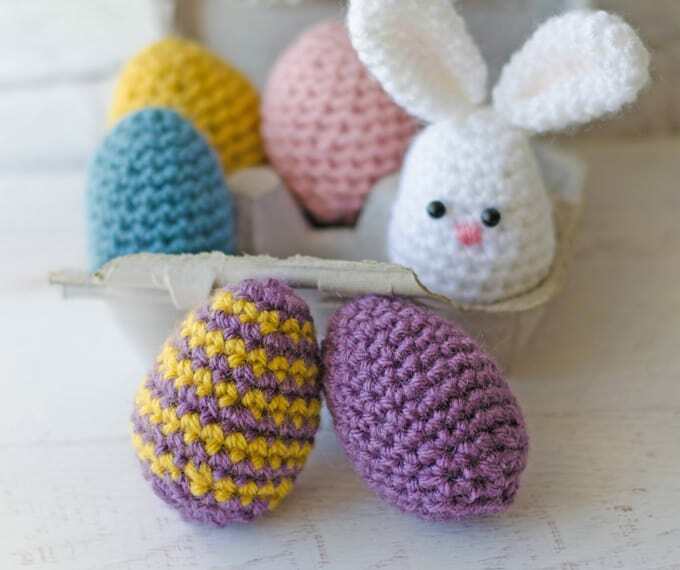 It will run really close to Easter, so if you can’t wait, pop over to Etsy or Ravelry and pick up the complete ad-free pattern for all 3 projects right now: the Crochet Easter Eggs Pattern, The Crochet Easter Basket and the Easter Egg Bunny Pattern. First up, these perfect eggs. I searched high and low for an egg pattern I liked. One that was not too pointy and rounded in just the right places. In worsted weight yarn with a nice sized hook. Because who wants to crochet eggs forever. When I couldn’t find what I wanted, I experimented until I made just the thing. 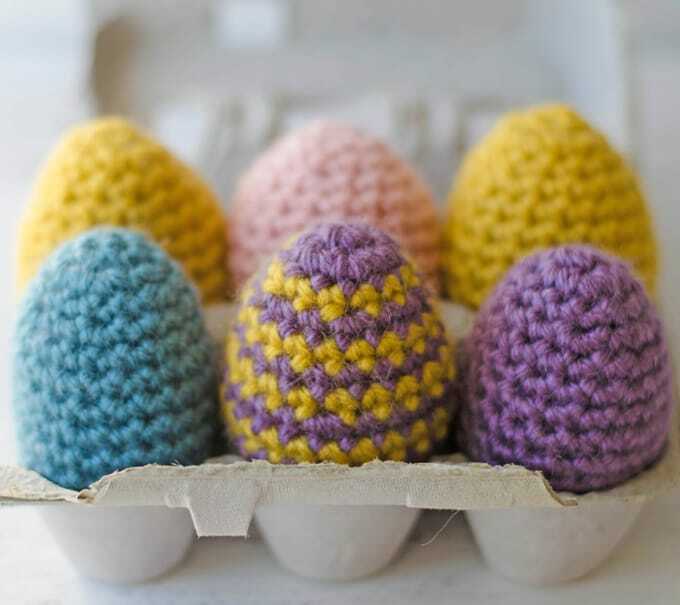 These crochet eggs start at the top so you can see a nice, neat finish and gradually build to chunky, rounded bottom. You can stuff them full for a jumbo sized egg, or not so full, for a large sized egg. If you want them smaller than that, drop down a hook size. Make them with scrap yarn in spring colors. For a striped egg, just alternate colors. Purchase an ad-free printable version of all THREE patterns in ONE! R12: *sc in next 2 st, sc 2 tog, sc in next 3 st, sc 2 tog, repeat from * once (14 st) Stuff firmly. R14: sc 2 tog around (5 st), sl st to next st. Fasten off, leaving tail for closing (bottom of egg) Add any additional stuffing. Weave the yarn through the opening to gather closed. Note: For the Purple and Yellow striped egg, I worked rows 1 and 2 with purple, then alternated yellow and purple, ending with purple in rows 12 -14. I carried the unworked yarn on the inside of the work when not in use. I love seeing your finished projects! If you share your Crochet Easter Eggs on Instagram, be sure to tag me @crochet365knittoo. If you are on Facebook, stop over to the Crochet 365 Knit Too Facebook page and share a photo! I’d love to see your work! Written pattern copyright Cheryl Bennett 2018, all rights reserved. Please do not reprint or repost this pattern. 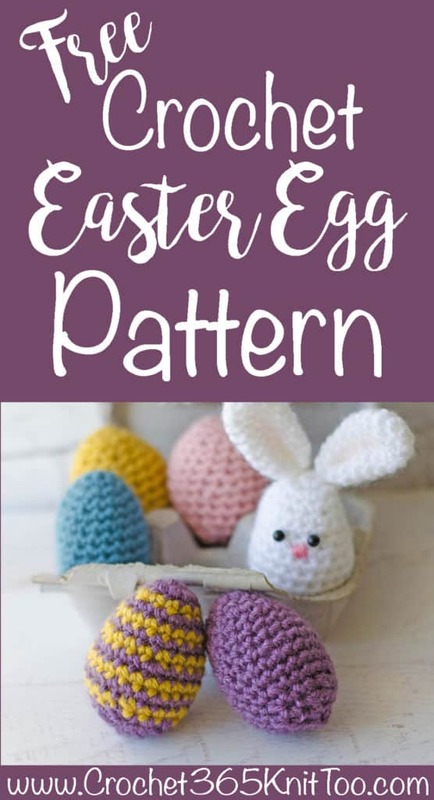 If you would like to share this Crochet Easter Eggs pattern with others, just link to this page. If you’d like to make items for sale from this pattern, please visit my About page for more information. « St Patrick’s Day Crochet Patterns ~ Shamrock Patterns Galore! Thank you so much for these wonderful Easter patterns; these eggs I can ‘hide’ in the outdoors and they will not be eaten by the resident coyotes or bears! So excited! You are a kind soul to publish these free patterns. At 82 + my funds are very limited and buying most patterns just not possible.I so appreciate what you do. I am so glad you enjoy my patterns! Thank you for taking the time to leave such a nice comment! I Love the bunny eggs I made them for my Grandchildren for Easter and they loved them it’s such a good pattern thank you for sharing with us .